and enrol in the good quiet of the books. in their new old home. Artists of the month at the Artotheque: Marja Paasio och Helga Rusanen. Oil paintings by Anja Hatva based on classic fairy tales like Little Red Riding Hood, Cinderella, Snow White and The Sleeping Beauty at the Corridor Gallery. Come and learn Finnish in Rikhardinkatu Library! The Rikhardinkatu Library of Helsinki has been acquiring a collection of Artists’ books since 2000. Currently, there are approximately 400 pieces in the collection, with both Finnish and foreign examples well represented. We offer both unique and limited editions of Artists’ books and feature exhibitions of selected artists on a regular basis. 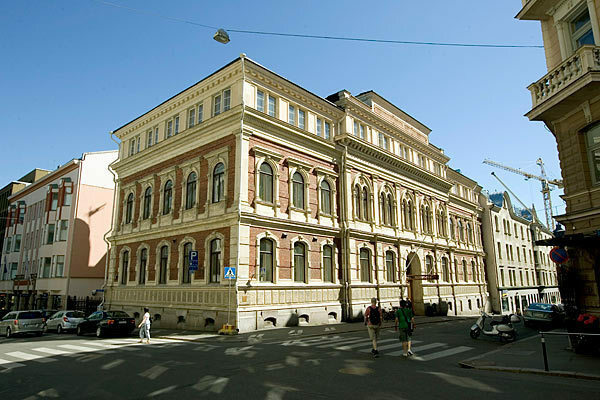 Rikhardinkatu library's work and meeting rooms can be reserved through City of Helsinki's reservation booking system Varaamo. Read more about this here! Find skeletons and more skeletons at Lena Bruun's exhibition in our Shelf Gallery (2nd floor).